Tracking down the Past along the Palace Walls Deoksugung Palace Lane winding along the stone wall of the palace is often compared with the streets on the Mont Martre hills of Paris. But the bustling atmosphere to be experienced in the street of Paris cannot be found in this most quiet quarter in downtown Seoul. 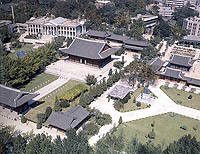 Right after the end of the Korean-Japanese War, the then king of the Joseon Dynasty settled temporarily in the residence of a prince located in the site of the present Deoksugung Palace and named it Kyongwoon Palace. 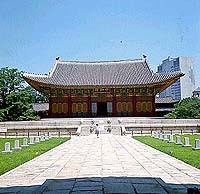 When, in the late 19th century, King Gojong and his court took refuge here to avoid another Japanese invasion, it was established as the main royal palace again. 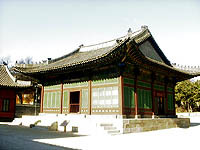 The king had the palace expanded and some new buildings, including the Sokjo-jun, a western style stone structure, were added to the traditional constructions. This rather small sized palace is loved by the young generation who enjoy dating here as well as the older office workers who try to take a rest in the tranquil space in the business district. If you had seen the unique scenes of the music video 'What You Give You Get Back' by the German rock group Scorpions, you might have found it was filmed in the palace ground. More and more visitors to Seoul feel the incomparable harmony of traditional and modern factors presented by the palace and its vicinity. The Changing of the Royal Guards Ceremony, which is performed around the front gate everyday except Monday from spring through summer and late fall, is another attraction of the area.